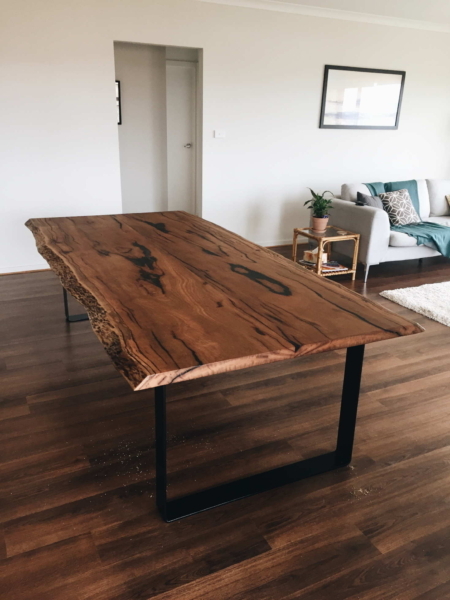 This Hoop Dining table is made from 2 Live Edge WA Marri Slabs. It is Crafted with precision, filled with epoxy resin and finished with Matt Osmo Polyx Oil for superior protection. Slab in photo: WA Marri, more timbers available at request. We offer wide range of Custom Made Furniture, Blackbutt Dining Tables, Custom Made Tables, Peninsula Entertainment Units & Oakheart TV Cabinets.